We study a number of (3 + 1)- and (2 + 1)-dimensional defect and boundary conformal field theories holographically dual to supergravity theories. In all cases the defects or boundaries are planar, and the defects are codimension-one. 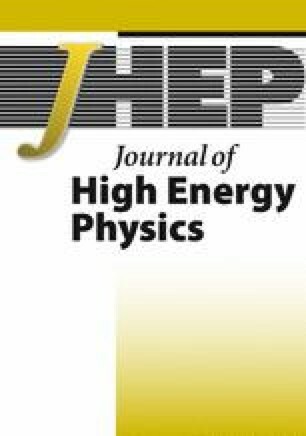 Using holography, we compute the entanglement entropy of a (hemi-)spherical region centered on the defect (boundary). We define defect and boundary entropies from the entanglement entropy by an appropriate background subtraction. For some (3 + 1)-dimensional theories we find evidence that the defect/boundary entropy changes monotonically under certain renormalization group flows triggered by operators localized at the defect or boundary. This provides evidence that the g-theorem of (1 + 1)-dimensional field theories generalizes to higher dimensions. O.J.C. Dias, G.T. Horowitz, N. Iqbal and J.E. Santos, Vortices in holographic superfluids and superconductors as conformal defects, arXiv:1311.3673 [INSPIRE]. N. Bobev, K. Pilch and N.P. Warner, Supersymmetric Janus solutions in four dimensions, arXiv:1311.4883 [INSPIRE]. D. Honda and T. Okuda, Exact results for boundaries and domain walls in 2d supersymmetric theories, arXiv:1308.2217 [INSPIRE]. K. Hori and M. Romo, Exact results in two-dimensional (2, 2) supersymmetric gauge theories with boundary, arXiv:1308.2438 [INSPIRE].